Although we didn’t restore it, it has an above average restoration. Note that the pump has also been painted on the inside, has new gaskets, new globe, etc. Besides the quality of the paint job (some minor runs you might not notice and a chip in the paint that can be touched up), What is different from the pumps we do and sell for $3,995? We use a heavier electrical cord, install an on and off switch, fix the computer to work, and have more parts re-chromed. This one is Only $2,695! 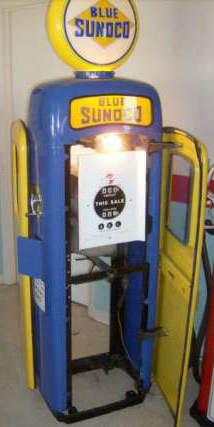 If you have any questions about having a gas pump restored for you give us a call at 304-728-0547 or send us an email.